..".Stefan Jurasinski, Lisi Oliver and Andrew Rabin deserve hearty congratulations for producing such a superb collection, one which engages the neophyte and challenges the experts. Unlike many such compilations, English Law Before Magna Carta contains no weak link; every chapter's thesis is clear, the arguments rigorous, the conclusions compelling. Brill too deserves praise for producing such an elegant and carefully edited volume. I recommend this book for any college library; it is certain to prove useful on many levels." 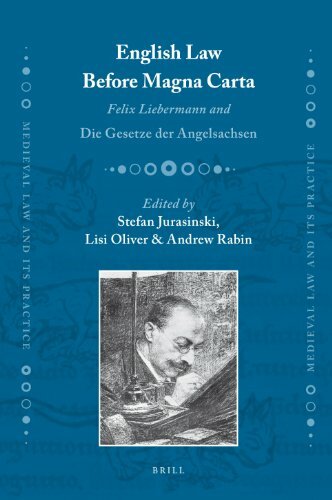 This volume marks the centenary of Liebermann’s Die Gesetze der Angelsachsen (1903-1916) by bringing together essays by scholars specializing in medieval legal culture. The essays address not only Liebermann’s legacy, but also major issues in the study of early law.